The Meguro name holds a special place in Japanese motorcycle history. Meguro Manufacturing Company got its start in the ’30s, investing in Harley-Davidson after the Wall Street Crash. Acquiring control of some of Harley’s technology, Meguro began manufacturing gearboxes and, eventually its own motorcycles. In the ’50s, Meguro began building clones of the BSA A7 with a 651cc Parallel-Twin engine. For a while, Meguro was Japan’s second-largest motorcycle manufacturer, only being outsold by Honda. In 1960, Kawasaki Heavy Industries acquired an interest in Meguro, and a few years later, Kawasaki assumed full control. 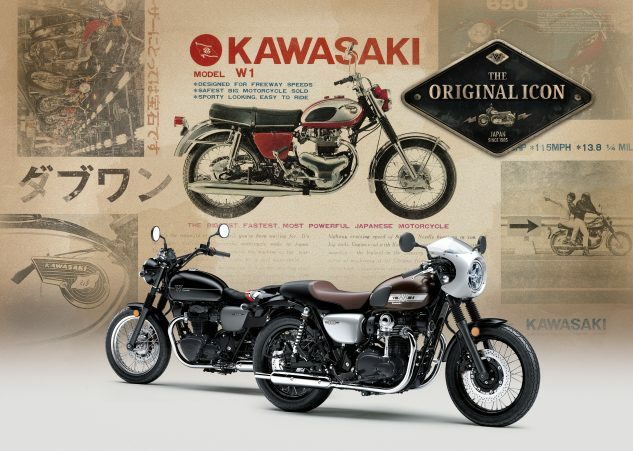 Kawasaki continued to build BSA clones, notably with the Meguro K1 and Kawasaki K2, and in 1965, the Kawasaki W1, the precursor to the modern W800 models. What this all means remains unclear for now. Meguro is an important part of Kawasaki (and Japan’s) motorcycle history, but is not as well known in other markets. The multiple trademark applications suggest Kawasaki has something planned beyond merely protecting its ownership of the name. A safe guess would be that Kawasaki has more retro models in the works, and Meguro will either be used for a new motorcycle or, perhaps, as a sub-brand for a line of models. As always, we’ll have more information here on Motorcycle.com as it becomes available. The post Kawasaki “Meguro” Trademark Filing May Hint at More Retro Models appeared first on Motorcycle.com.